I saw an interesting tweet from Leighton Andrews over the weekend. In the tweet the former Labour Minister was congratulating a Tory AM on retaining his list seat. Unless you've been living under a rock these past few days you'll be aware that Leighton Andrews lost his constituency seat due to the Rhondda putting their faith in Plaid Cymru leader Leanne Wood. Having fine tuned my list seat spreadsheet I entered the results to see what would have happened had the Rhondda not woken up. At least we now have one less Labour hypocrite. The maths behind this is actually quite easy to work out but it's even easier to screw it up so badly that you pout, delete everything and redo it the following day. Scenario A (What actually happened). Leanne wins Rhondda giving Labour 7 seats and Plaid 1. Labour's list seats are divided by 8 and Plaid's by 2. All other parties have theirs divided by 1. After dividing the Tories now have the most votes and win the first list seat. For the following seat all the calculations remain the same except for the Tories whose original vote is now divided by 2 (seats won +1). Plaid now have the most votes which means that Neil McEvoy wins the second list seat. Neil was originally second on the Plaid list but was promoted when Leanne won her constituency. This poses another interesting question, would Neil have won a seat had Leanne not won the Rhondda? Once again all calculations remain the same as the last step except Plaid's original vote is now divided by three. UKIP win the third seat which poses yet another interesting question. Would they have won the seat had Leanne not won the Rhondda? Again, all calculations remain the same as the previous step except UKIP's vote is now divided by 2. The last seat is won by Leighton Andrews' Tory buddy David Melding. This gives us the following result from the region. Tory 2, Plaid Cymru 1 and UKIP 1. Clicking it is proven to reduce squinting. Scenario B (The darkest timeline). In this scenario Leanne doesn't win Rhonnda so Labour take all 8 seats in the region. For the first list seat all parties have their votes divided by 1 except Labour whose vote is divided by 9. 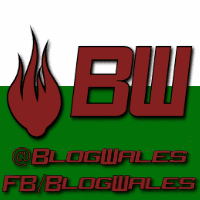 Plaid Cymru take the first seat quite comfortably. Leanne Wood was first on the list so she is elected. You know the score by now, Plaid's vote is now divided by two. 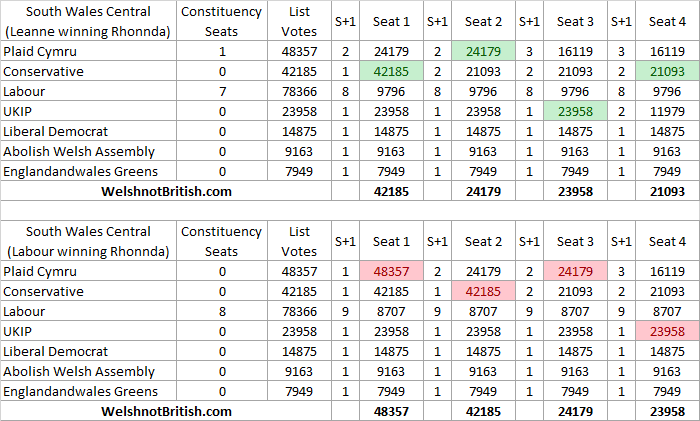 The Tories take the second seat meaning that after two stages the list seats are no different to what actually happened. The Tory vote is now divided by 2 for seat 3. Plaid Cymru take seat 3 meaning that Neil McEvoy is elected. So now we know that Leanne winning the Rhondda didn't alter Neil's election one way or another, he still would have been elected regardless. For seat 4 Plaid's vote is now divided by 3. UKIP take seat 4 meaning that in The Darkest Timeline the results would have been Plaid Cymru 2, Tory 1 and UKIP 1. 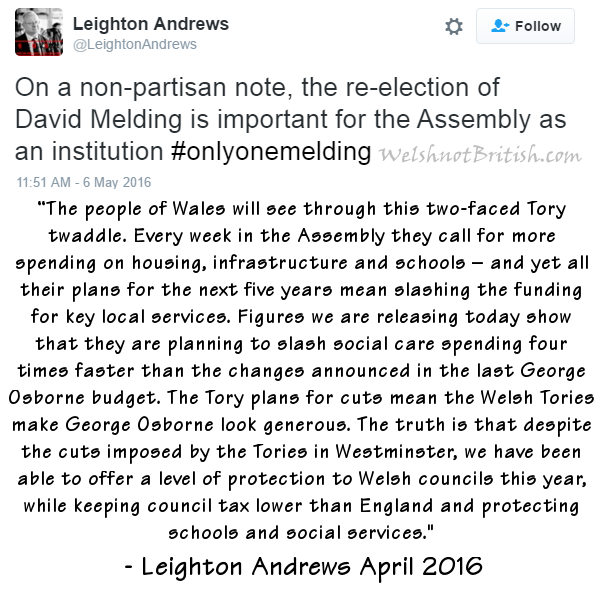 So there we have it, Leanne Wood beating Leighton Andrews meant that David Melding kept his job. It didn't alter UKIP being elected and it certainly didn't help or hinder Neil McEvoy. And yet, despite all these calculations we're still not able to work out why a former Labour Minister was so quick to congratulate a Tory, especially when less than a month earlier he said the following about the Tories on both sides of the border. If anyone spots a congratulatory tweet from Leighton to Leanne Wood could you please let me know as I've looked and I can't see one.